Starting Water Wash, another tributary of upper Kaibito Creek, flows unremarkably for many miles across the flat Kaibito Plateau of north Arizona before forming a very spectacular slot canyon near the junction with the main creek. At first the canyon has short sections of narrows 20-40 feet deep, interspersed with more open stretches but eventually it becomes much deeper, often very dark, although always exciting and photogenic. About half a mile before the junction with Kaibito Creek, the wash descends steeply in a series of sheer drops with some pools, large boulders and log jams. Some parts are pitch black, as the canyon becomes less winding and more cave-like. 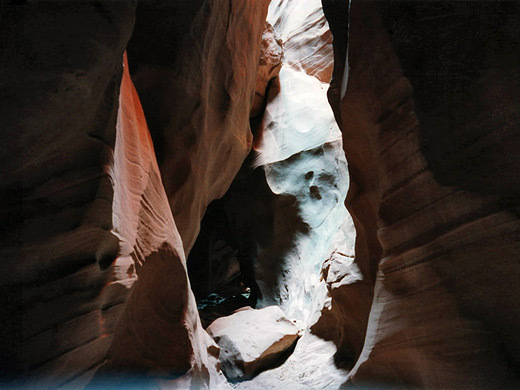 To travel through this part of the canyon is rather difficult, but the earlier section is easy and very scenic; Starting Water Wash is probably the best long slot canyon in Arizona with easy access. Starting Water Wash is reached by driving 9 miles north along a good quality dirt track that joins highway AZ 98 and also passes close to the Kaibito Creek and East Fork slot canyons. The wash is easily recognizable, as the track descends into a small steepish valley and crosses the streambed on a wide bridge; the narrows begin about a third of a mile downstream. 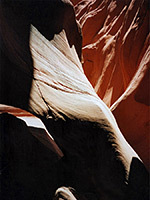 Not currently available; the Navajo have not allowed any access to the canyon since 1998. 8 views of Starting Water Wash. The streambed is dry for most of the year and at first has a floor of soft sand bordered by weathered, sloping rocks on each side. The canyon begins gradually; the narrows are at first only 6 feet deep and with more open stretches at intervals. After 30 minutes walking the slot is around 30-40 feet deep, very narrow in places yet still generally light and sunny. The floor is now covered by a mixture of sand and stones, mostly quite flat but with occasional drops of a few feet, often with car tires and other flood-borne debris wedged between the boulders. 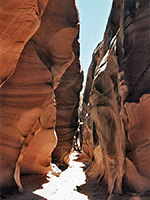 Around this point the passageways are crossed by several mineral veins extruded vertically into the otherwise flat layers of red Navajo sandstone that form the canyon walls. Logs are jammed between the walls at intervals - some high above the floor, others low, impeding progress slightly. Crows nest in crevices high in the cliffs above, their occupants filling the narrow passages with eerie, echoing cries. Apart from these and other birds, wildlife in the vast, sandy Navajo reservation is limited to whiptail lizards, snakes and coyotes. 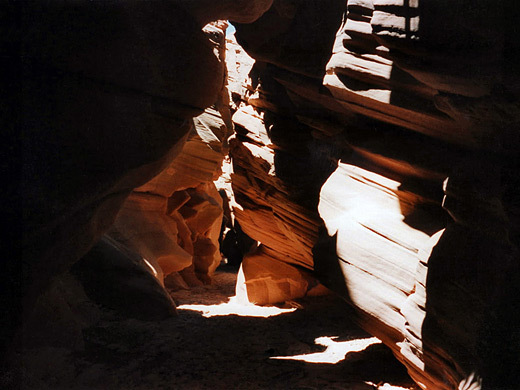 After 40 minutes walking (1.5 miles) the canyon becomes so deep in places that little sunlight can penetrate, and some passages are dark and creepy, but always the rocks are delicately shaped and colorful. 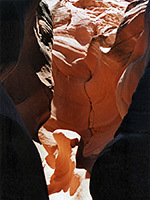 There are a few short side-canyons; one is especially curved and twisting, formed by a chain of circular potholes linked by narrow channels in the rock. For a few hundred yards the cliffs open out and become less steep but then close in sharply (after about an hour); just before is the last of several climb-out places that allow for an exit of the canyon up to the sandy desert above. The slot is then very narrow, dark and twisting, with sharp S-shaped bends, chokestones, small pools, downward steps of 3 feet or so, and (probably) log jams. The narrowness of the canyon means that such obstructions can create a blockage 20 feet or more high, but the next major flash flood tends to wash them away, so the exact conditions are ever changing. The canyon opens out a bit but deepens quickly, with several large boulders, one of which has a drop of 15 feet on the far side; a belay point may be present to attach a rope, though free climbing down is not too difficult. After here are more boulders with other, less steep dryfalls, as the ground becomes muddier, with a chance of quite deep pools if the canyon has flooded recently. The canyon straightens but is now so deep that the light fades away completely - the passage ahead is pitch black despite being quite wide. This is a good point for casual hikers to turn back, since a flashlight and ropes are needed to continue, as taller drop-offs and pools lie ahead, but if suitably equipped it is possible to continue all the way to Kaibito Creek as well as exploring other side canyons. Still, the hike to this point is very exciting - a real adventure - and the slot canyon is as spectacular as any in the Southwest.